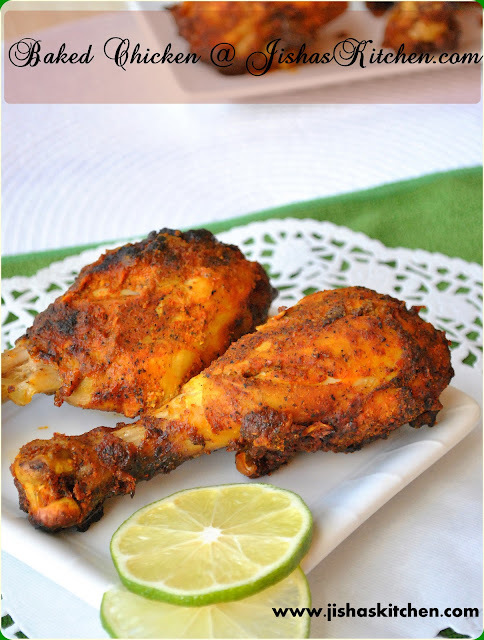 Kerala Style Baked Chicken by ! Jisha's Kitchen ! 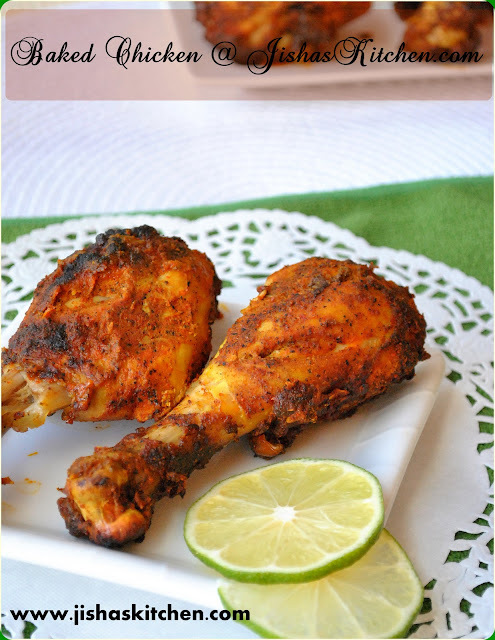 Today I am sharing the recipe of Kerala style baked chicken / Kerala style chicken fry. It is very easy to prepare and is healthy too. I just used 1 tsp oil for this recipe. First wash the chicken drumsticks and drain it nicely. Then using a knife make 2-3 gashes on each chicken drumstick. Then dry roast red chilly powder, turmeric powder, fennel powder and black pepper powder in a very low flame, till the powders become dark in color but do make sure not to burn the powders. Allow it to cool. Then in a bowl take roasted powders, garam masala, ginger-garlic paste, lemon juice, curd and salt and mix it to form a smooth paste. Then marinate the chicken drumsticks with this paste and refrigerate for about at least 1 hour. I kept it for about 4 hours. Preheat the oven at 400 F. Meanwhile line the baking dish with aluminum foil and then grease it with oil. You can even use cooking spray. 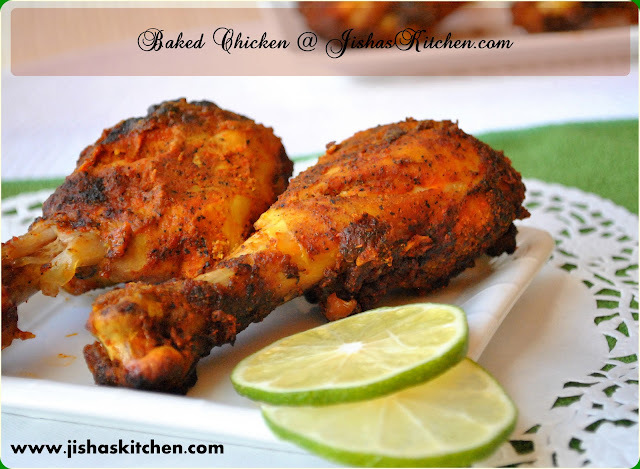 Then place the chicken drumsticks on the baking dish and place it in the middle rack of the oven and bake it for about 35-40 minutes. After the first 20 minutes, flip the chicken and continue baking. After baking, broil it for about 5 minutes. Broiling will give the chicken drumsticks a golden brown color. Note: Baking time may vary depending on the oven.